This St. Patrick’s Day resource has opportunities for reading, making a mini book, drawing, coloring, working with compound words, and writing. This original story is about a boy who has a knack for fooling a sneaky leprechaun. 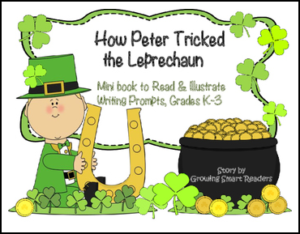 Kids will read how Peter tricked a leprechaun in this mini book. ~Mini book (12 half pages) for students to assemble, read and illustrate. ~Cut and staple together for a simple little book to read and illustrate individually or with a reading buddy. ~Three additional full pages for responding to the text, working with compound words, and writing prompts. I hope your students have fun with this!